Could you recommend a book or guide? + “It depends” type answers will often be correct. + Answers that encourage *others* to self-organize in questions such as ‘What would *you* do …’ will most likely be correct. + Words like ‘has to’, ‘must’, ‘need to’, ‘can not’ are indications of wrong answers. I’ll study for the PSM-I. 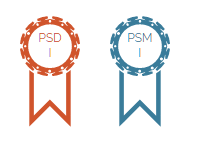 I Just passed the PSD-1.